Jordi Savall’s explorations of nonWestern repertoires continue with this luxuriously presented collaboration between the members of Hespèrion XXI and musicians from Syria. Savall notes that the project ‘was conceived as an act of solidarity to help raise awareness of this dramatic conflict and the terrible war of repression suffered by the Syrian people’. 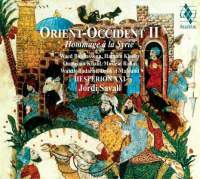 The music recorded thus includes not only Syrian music, superbly performed by a quartet of Syrian musicians and members of Savall’s group, but pieces from what he calls ‘Old Christian and Jewish Hesperia’ and medieval Italy. Thus, medieval Italian dances, Cantigas de Santa Maria and so on are interspersed with the Syrian music. About the latter, the several substantial essays included in the magnificent book are lamentably silent, preferring to concentrate on the wider historical and cultural trajectories. The juxtaposition of repertoires is effective, the medieval pieces acting as a kind of musical bridge between the West and the East. Particularly outstanding contributions are the ney-playing of Moslem Rahal, accompanied by Pedro Estevan on percussion in Shaouia, the catchy sequence of love songs Mawal Sap’awi, ‘Ala Al-‘Aqiqa, Beiny wa Bainak, featuring all three of the guest singers, the Maronite Christian devotional song Ya Mariam el bekr, sung by Oumeima Khalil, and the heart-rending qalaq The Colour of Anguish, featuring the magnificent voice of Waed Bouhassoun. Not crossover, then, but dialogue. More of that is definitely necessary, especially when it produces such outstandingly beautiful results.